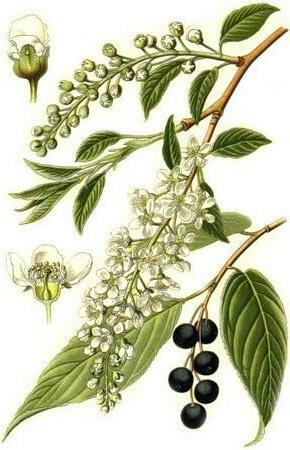 The bird cherry tree ordinary (Padus avium Miller). At least August poured juice, krupnaya black as pitch, the fruit of the cherry. No, perhaps trees unhappiest of bird cherry. Twice a year break its branches: in the spring, when she wears a white lace flowers, and in late summer, when ripe fruit. And it is crippled, polyserena. But the cherry tree is not only the first beauty of the Northern forests. Its leaves volatiles - volatile, which kill bacteria, recover the air, and the cherry berries contains various sugar, Apple and citric acids, flavonoids, tanning agents. The infusion of the fruit of the cherry better bilberry strengthens the stomach. Dry brush immediately after harvest, and it is possible and a few days later. If the cart is in a cool place, the fruit of the cherry do not deteriorate with time, as their volatile have antimicrobial properties and detrimental affect on fungi. Dried them usually in the dryer with the temperature 40-50°, can be dried in the sun, rassypaev their layer is 1-2 cm in the nets or on beds of cloth or paper, stirring occasionally. With dried fruits cut stem and put the fruit in boxes (bottom made of paper).